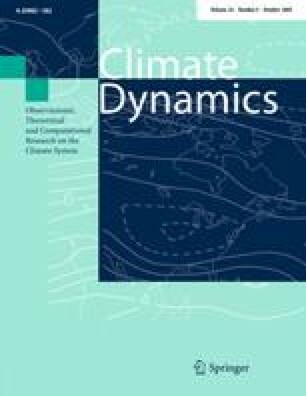 We investigate the causes for a strong high latitude imposed ice (land or sea) influence on the marine Intertropical Convergence Zone (ITCZ) in the Community Climate Model version 3 coupled to a 50-m slab ocean. The marine ITCZ in all the ocean basins shift meridionally away from the hemisphere with an imposed added ice cover, altering the global Hadley circulation with an increased tropical subsidence in the hemisphere with imposed ice and uplift in the other. The effect appears to be independent of the longitudinal position of imposed ice. The anomalous ice induces a rapid cooling and drying of the air and surface over the entire high- and midlatitudes; subsequent progression of cold anomalies occurs in the Pacific and Atlantic northeasterly trade regions, where a wind-evaporation-sea surface temperature (SST) feedback initiates progression of a cold SST ‘front’ towards the ITCZ latitudes. Once the cooler SST reaches the ITCZ latitude, the ITCZ shifts southwards, aided by positive feedbacks associated with the displacement. The ITCZ displacement transports moisture away from the colder and drier hemisphere into the other hemisphere, resulting in a pronounced hemispheric asymmetric response in anomalous specific humidity; we speculate that the atmospheric humidity plays a central role in the hemispheric asymmetric nature of the climate response to high latitude ice cover anomalies. From an energy balance viewpoint, the increased outgoing radiative flux at the latitudes of the imposed ice is compensated by an increased radiative energy flux at the tropical latitudes occupied by the displaced ITCZ, and subsequently transported by the altered Hadley and eddy circulations to the imposed ice latitudes. The situation investigated here may be applicable to past climates like the Last Glacial Maximum where hemispheric asymmetric changes to ice cover occurred. Major caveats to the conclusions drawn include omission of interactive sea ice physics and ocean dynamical feedback and sensitivity to atmospheric physics parameterizations across different models. The idea to examine global climatic impacts of sea ice anomalies was first suggested to us by David Battisti, and we thank Camille Li and Andrew Friedman for their useful discussions. The model integrations were done on the IBM-SP maintained by the scientific computing division at National Center for Atmospheric Research (NCAR), and some of the analysis of the model output was done using the AMWG diagnostics package developed at NCAR. CMB gratefully acknowledges the support of the National Science Foundation (NSF) through grant AM0304662, and JCHC through NSF grant ATM-0438201.